So, when I am writing this, May is officially over. Its weird, it really felt like I was cheating when I put on other-made clothes this morning. I am truly pleased with the outcome of this months project. Not only have I become more aware of what I really wear, I have got a lot of inspiration and feedback from the other participants in MMM. It´s been a great way for me to get connected with other “sewing-fanatics”, it´s been so much fun! It really fits perfectly with my own challenge. Lastly, Zoe, the awsome woman who came up with the MMM- idea, has now announced that there will be a Self-Stiched-September too. During MMM we were about 80 participants, for SSS, we are trying to break the magic limit of 100, so come on and join! Lucky for me, when September is closing in I´m packing my bags and heading for Greece, to have a couple of weeks of peace and quiet. So I can work my summer wardrobe even a couple of weeks more that I normally would. 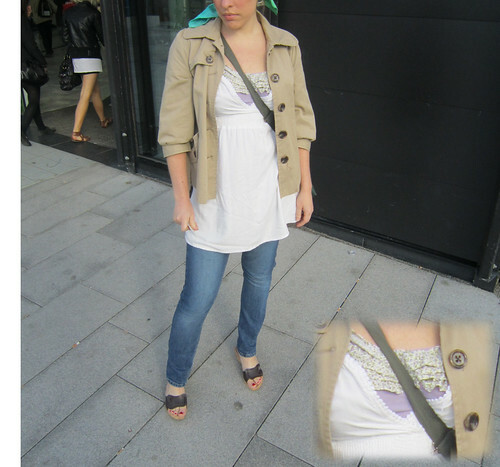 Day 24: a refashion-day. Refashioned top and jeans. Day 25: Me-made top. thrifted fabric and buttons, and handmade lace I got as a gift. 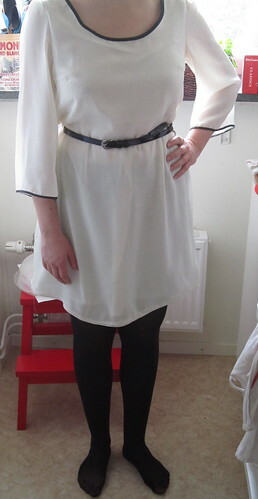 Day 28: My Jackie Kennedy dress, made of white polyester chiffon, but I´ve lined it with cotton, so it´s not so bad even in hot weather. 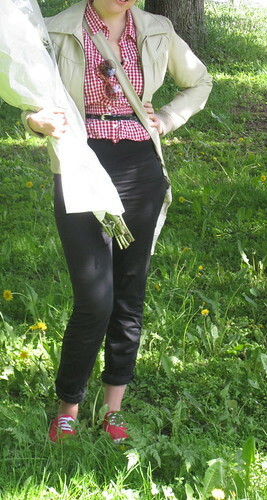 Day 30: Me-made black cotton-sateen pants and refashioned blouse. Wow! You’ve got quite a few challenges — isn’t it wonderful how it inspires us? I did the Wardrobe Refashion pledge for two months, I didn’t sign up again, partly because I wanted to buy a few items that inspire me to sew more (odd how that works, no?) but I found I have very little desire to buy at all 🙂 Looking forward to seeing how you like it.